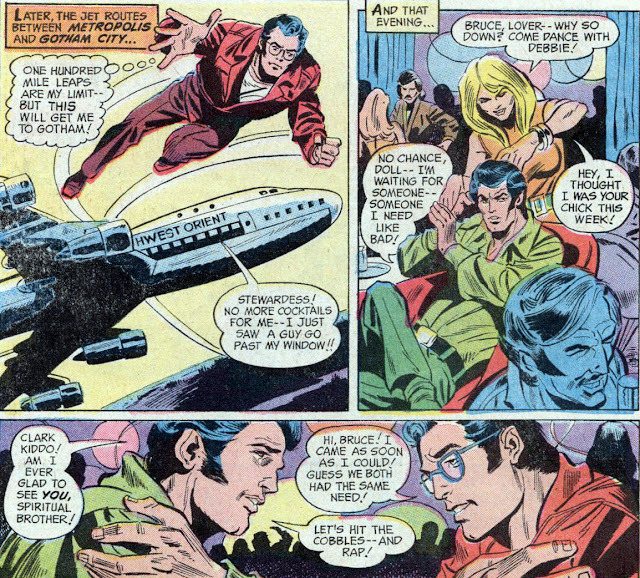 Chances are that if you're reading these panels in 2012, you're probably chuckling a little at the unintentional double entendre: to modern eyes, it seems as though World's Finest writer Bob Haney is suggesting that his creations, Clark Kent Jr. and Bruce Wayne Jr., might have an even closer relationship than their famous fathers - insert requisite "wink wink, nudge nudge" here. But unless Bob Haney is even more clever than he's already given credit for, readers should probably assume that these 1970s tales were not intended as underground endorsement of alternative lifestyles. Indeed, most of the stories of the Super-Sons revolved around the then-current Generation Gap, with Clark Jr. and Bruce Jr. often agonizing about how they could never measure up to their dads and how their square fathers just didn't understand what it meant to be a teen in the swinging 70s. Taken at face value, as these stories probably should be, what we see here is simply close friendship between two young men, men who aren't afraid to express how much they need each other as they lean on one another for emotional support. In chuckling at this scene and others like it, I have to ask myself if the laughter isn't simply some kind of strange defensive reaction. Intimacy between men, even in these relatively enlightened times, is still seen as somewhat effeminate (another moral land mine - assuming that femininity is somehow "weaker" or a bad thing) or at best, overly expressive. Or at least this seems to be true among WASPs; members of other cultures are often less inhibited. I suppose the point I'm clumsily trying to raise is this: when we take a work of popular culture out of context and laugh at it, are we saying something about the artifact's failure to transition to our era, or are we saying something about our own inability to work past our own deeply ingrained attitudes and prejudices? According to Rule 34, someone out there has already answered some of these questions by writing Super-Sons slash fiction. I'm not quite brave enough to look there for answers. I don't follow comics the way you do, Earl, but I know I can add to the conversation by quoting from one of my favourite experts. Good Lord! I guess it was bound to happen, posting once a day for nearly two years straight.